Join the dynamic trio of Marius, Jo and Bruno as they talk about what games they have been playing, in this our last non special podcast of the year. We talk about The Wolf Among Us, Device 6, BEYOND: Two Souls, Forced and many other great games. Join a depleted Monkey Tail crew as they talk about their trip to Eurogamer Expo 2013. There’s talk about the two next gen consoles, Xbox One and PS4 as well as plenty of talk on games such as Titan Fall, Dark Souls, BEYOND: Two Souls and many more. Oh and there’s also plenty of time left for Marius, Jo and Bruno to get to grips with Grand Theft Auto V single player campaign and its online "false start". Join the Monkey Tail crew as they embark on a very special 24 hour gaming marathon, in aid of the charity Special Effect. Cue much gaming hilarity, from Micro Machines tournaments to adventures with Gravity Yoghurt. Join the Monkey Tail Staff as they celebrate their first year of podcasting and pick their individual top five games of the generation. There’s also time for a quiz many laughs and talk of the upcoming 24 hour gaming marathon in aid of the charity Special Effect. Join Bruno, Marius and Jo as they get under the skin of The Last Of Us in this special spoiler filled podcast. Story spoilers from the very start, consider yourselves warned! 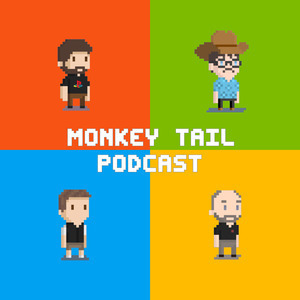 Join the Monkey Tail team, as they ruminate on what they've been playing, and of course there's a lengthy discussion about the Xbox ONE. Join Bruno, Jo and Marius as they discuss what they've been playing including, Bioshock Infinite, God of War Ascension, Real Racing 3 and Jurassic Park Builder. There’s also a couple of video game quizzes; Music Quiz and who am I. Join Bruno and Marius on this special spoilercast but please be aware, like the title suggests, there will be loads of story and gameplay spoilers from Bioshock Infinite, right from the start… consider yourself warned. Join the Monkey Tail staff as they discuss what they've been playing including, Metal Gear Rising: Revengeance, Tomb Raider and Crysis 3. There's also a new quiz feature and Room 101. Join Bruno, Ceri, Mick and Marius as MT goes back to the normal format, we talk about Dead Space 3, Assassin’s Creed 3, Hitman: Absolution and all the other games we’ve been playing. There’s also Room 101 and a video game music Quiz. Join Bruno, Ceri, Mick and Marius on this special podcast, as they discuss the PlayStation 4, the DualShock 4 and all the announced PS4 launch window titles. Join Bruno, Jo, Mick and Marius on our first recording of 2013, we try out our new feature "Video Game Room 101" and listen to Mick's exploits in Thailand. Join Bruno, Ceri, Jo, Marc and Marius on this special episode, we do our very first video game quiz and also find time to pitch randomly generated video game titles to hilarious results. The Monkey Tail staff discuss the latest video game news and new releases, we talk about Dishonored, Resident Evil 6, Halo 4, Assassins Creed 3 and much more.